“sehsaal” is both an ongoing art project and a location for art-related ventures. It is open for artistic, architectural and socio-political articulations that reflect today's conceptions of space. The utopias and aesthetic achievements of 20th-century modernism should be re-evaluated and explored as a source of effective ideas for the future, especially since we live in times of a conservative turn. In our rapidly changing society, buzz-phrases such as “form follows function” or “less is more” still function as clear-cut standards for an examination of profit-maximizing real-estate strategies and related economic dependencies. Architecture in this sense is understood as a social and political field of action that promotes discourse on new paradigms of living. Alongside these modernist architecture concepts, virtual space – an omnipresent public phenomenon – opens up an alternative realm that is increasingly taking over the function of public space gone missing, and exercising growing influence on social and political structures. “sehsaal” focuses on artistic positions that deal with the digitization of space and investigate / translate its social aspects. It is a forum for discourse between private and public space. 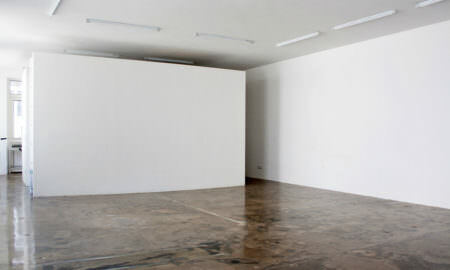 Painting is able to take an experimental position within space and question established structures. Painting moves into space, changing and expanding it. Painting is able to discard physical, social and political boundaries. Painting is welcome at “sehsaal”. The moving body structures space through its geometric forms and figures. Surrounding space is perceived in relation to the performance and vice versa. Dance itself is not only able to create architecture, but also uses spatial perception and dispositions as basis for numerous movements. Dance can embody emotional aspects and immaterial conditions of existing rooms. Besides hosting and realizing exhibitions, “sehsaal” offers a platform for discussions, film screenings and workshops. Co-operations with art-related institutions in the neighbourhood are intended.